What is Xenon HID Conversion Kit? 1. 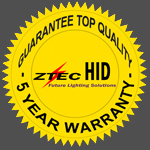 What is HID Xenon? HID lamp (High-Intensity-Discharge) is the top product of the Metal halide lamp .Unlike Halogen lamps, HID lamps don't have a filament but create light by the arc between two electrodes. There are distinctive metals contained in the arc tube: high-pressure Xenon (99.99%), mercury and metal halide. When starting voltage is applied to the electrodes from the ballast or igniter, an arc is formed between them. The arc activates the Xenon, which in turn ignites the metal halide. The result of this action is the emission of light energy. Due to the high pressures of HID lamp operation, these wavelengths are concentrated in the visible light spectrum. We can get the desired color temperature through changing the pressure of HID lamp or the proportion of the metal halide. Super Brightness: The brightness and its luminous flux are increased by 300% as that of the halogen tungsten lamp, so that the lamp can radiate to higher, wider and farther place. Good color temperature: The color temperature is approximately 4300 K –10000k compared to 3000 K for halogen lamp. The common choose is 5500k,which is close to the sunlight and comfortable to our eyes, also benefit for the safe driving indirectly. Low power consumption and high efficiency: The power of Xenon metal halide lamp(35Watt,) for vehicle is only around half of tungsten halogen lamp but emitting 3 times of light. Quick start up: From starting up to reach full light, halogen lamp takes about 15 minutes, while HID lamp takes less than 0.001 second to start up and it can reach 85% of its full light in 1 second. For hot-re-strike, it takes several seconds to stabilization; for pulse-start ,it takes 10-20 seconds. Extremely long life: In practical terms, the life span of the bulb is equal to that of the car. Service life is at least 3000 hours, greatly above total hours of an automobile during normal night, which means that the bulb need only be replaced in exceptional cases. 3. Why we use HID Lamp? On the road, HID Xenon lighting systems appear as a bright white beam which resembles natural daylight. The bright white beam offers greater visibility and road safety. High efficiency make the requirement for cooling the lamp lower and can reduce the aging of the lamp chimney. Extremely long life make the HID lamp in proper condition without maintenance. The constant power and brightness in such a huge range of input voltage make HID lamp unparalleled. Quick start-up technique is the best solution for automobile lamp. This is a plug & play unit. Simply replace your factory bulbs with Our Xenon bulbs, plug the bulb to the ballast, and the ballast plugs to the factory OEM harness.